The anti-capitalists are still with us, and how. Robert Murphy has decided to give them an in-your-face economics education that they won't forget — ever. His approach comes from years of teaching undergraduates and dealing with the most common errors. He also draws from his teaching experience at the Mises University to offer an Austrian perspective on economics. He offers explanations and examples that are clear and compelling. What's wrong with zoning? Murphy explains it. Isn't outsourcing destroying America? On the contrary says Murphy: it is a wonderful for Americans! Shouldn't the rich fork over in the name of social justice? Murphy says that this would make us all poorer. Isn't the Fed protecting us against depressions and inflations? Precisely the opposite, he says: the Fed is causingeconomic instability. In so many ways, this book is a product of the Mises Institute. Murphy learned his economics at the Mises University (while getting his PhD at New York University) and then began to teach at our programs. He now serves as the headmaster of the Mises Institute online classroom. This could be the most accessible and compelling introduction to free-market economics since Hazlitt's Economics in One Lesson. Certainly economics has rarely been this fun! The socialists and Keynesian of the world will hate this book and make it a target of all their venom. But if they read it, they might learn something. This book is sure to become a hot seller, and a major source of controversy on campuses. A previous book in this series landed on the New York Timesbestseller list. How splendid to think that with this book, the Austrian perspective is receiving yet another boost in public life. 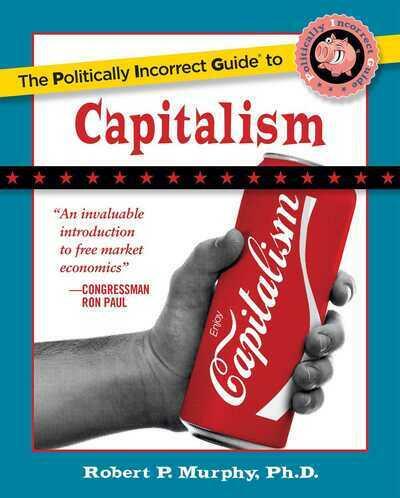 Barron's writes: "The Politically Incorrect Guide to Capitalism (Regnery, 2007), by economist Robert P. Murphy, contains more economic wisdom in its fewer-than-200 pages than the average principles textbook several times its length. In clear and often irreverent prose, Murphy makes a compelling case for the unfettered free market..." Breezy, witty, but always clear, precise, and elegantly reasoned, The Politically Incorrect Guide to Capitalismis a solid and entertaining guide to free market economics written from the perspective of the Austrian School. Murphy deploys all his abundant talents here, and to spectacular effect. To Bill Wilkins, the Amero doesn't exist. It's made up as a "Spencer's Gift" type souvenir. The U.S. government has no plans to institute such a thing and you are nothing more than a crack job conspiracy theorist. Despite the appearance as though some genuine thought actually went into the first reviewer's comments, it should be made clear *in no uncertain terms* that Murphy DOES NOT assert that we live in a truly free market. In fact, just the opposite is true: he clearly states up-front that a completely free market is now mostly theoretical, & definately does not exist anywhere in practice. Obviously, for him to claim that America or the global economy is an unobstructed marketplace where liberty & true capitalism reigns supreme would negate the purpose of the book's thesis (that is, to show why complete liberty IS always our best option, & whenever/wherever markets have been allowed to thrive then societies have also thrived--all RELATIVELY). I suspect that this reviewer flipped through & pulled a few (what he believes to be) counterpoints--all of which are fallacious and/or simply untrue. Murphy also never claims that huge national debts are okay. This book is well written & entertaining. I read Murphy's book and I am extremely disappointed in the views expressed in it. I am mostly disappointed with the vonMises Institute featuring it on this website. Of course Mr. Murphy has the right to express his opinions, this is still a free country (more or less) but in his expression of what he calls capitalism, you can see his Neo-con agenda. I can cite numerous examples for this opinion, but I will only mention a few here. He specifically (in numerous spots in his book) assumes that there is a free market at work in global commerce. The fallacy here is that there is NO truly free market in the world today, except for locally and maybe eBay. The controls instituted by the IMF (Confessions of an Economic Hitman)  have destroyed the economies of most of the worlds countries, and have forced the previously independent peasants into cities to work for dirt cheap wages manufacturing the Wal-mart slave goods he so eloquently defends. Another more specific example of this is his attitude regarding the commercialization of animals. In Chapter 6 he says that the best way to preserve endangered species is to make them commodities. There is a modicum of logic in this concept if you are totally amoral about the treatment of animals. The bison of the late 1800's were commodified by the buffalo hunters, even though they were used ethically by the Plains Indians (killed mercifully, and fully utilized), the commodification of their hides drove them to the verge of extinction. Also witness the evil that is done to animals in China today, especially the ones used for "leather and fur" to sell to the West. Traditional cultures would never treat animals that way. One more example is that his saying that there is virtually no negative impact about running up the national debt to astronomical proportions, except for the government monopolizing the credit market. That leaving a tremendous debt is not a real issue for our descendants. He fails to mention that there is a reason for what is going on in the bailouts, and that is to destroy the dollar; does the Amero ring a bell? That is what is happening, and that is why Bush, Paulson, Obama, and Geithner are all on the same page. That is why Greenspan called for nationalization of the banks. Both political parties have the same agenda. I thought the vonMises Institute were truly independent thinkers, and supported true free-market economic thinking, but I see the Neo-con agenda here as well. from PA Well worth it! I just finished reading this page turner, and I must say that I am quite pleased. Each topic of the book is dealt with in a manner that anyone over the age of fourteen could understand, yet at the same time, someone who is well versed in economics would thoroughly enjoy reading it. With that said, I think the best thing about this book is that you could possibly convince someone (who needs convincing) to read it and they would most likely follow through with it. The format of the book makes it more appealing to people that are not particularly interested in economics (or so they thought). I listened to a radio interview of the author between November 10 - 26th (2008)  either on WFAE-FM or WBT-AN in Charlotte and have serached to find it on the Internet -- alas, in vain. It Was a superlative hour and I would love to hear it again. Can anybody out there help me find it? Email me if you can help. Mr. Murphy is brilliant in correcting a plethora of misinformation about just what capitalism is -- and also, what it is NOT. Raising taxes: why it is never "responsible"